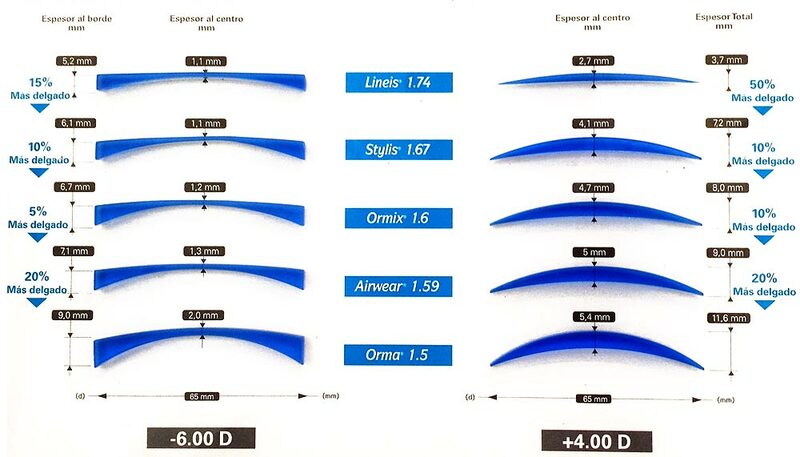 Factors such as the size of the lens, graduation and IPD influence the thickness of the lens. Our qualified technicians will verify that the index of your lens is suitable for you. Standard organic glasses CR-39. Good relation quality-price and great performance. It is recommended in corrections of up to ± 2.00 diopters. These glasses are appropriated for rimless frames due to their size. They are glasses much thinner due to a high reduction rate. They are more comfortable because they weigh less. They are perfect for rimless glasses, suitable for corrections between ± 2.00 and ± 4.00 diopters. Aspherical glass, they are much thinner at the edges, reducing distortion, giving the eye a more natural vision and achieving a greater esthetic effect. These glasses are up to 35% thinner than CR-39 (index 1.5), therefore they are much lighter and comfortable. They are ideal for rimless frames and for corrections between ± 4.00 and ± 6.00 diopters. These ultra-fine glasses are up to 50% thinner than CR-39 (index 1.5), and are much lighter and comfortable then the rest. They are ideal for rimless frames and are used for corrections less than ± 6.00 diopters.